I was watching stage 7 of the Tour while leafing through a picture book on the Ti-Raleigh team of the 1970s and 1980s. Nothing much was going on in the stage so I had time to reflect. I mused about what a time traveler, transported from the TdF in 1978 to the TdF of today, would think. The small towns of France would look familiar as he passed through, with their grey stone buildings, slate roofs, tree-lined roads and Bar, Tabac, and Cafe signs along the way. The road furniture would be disconcerting, perhaps, and the roads might seem strangely smooth. Some of the publicity might be familiar, such as the Vittel signs. The cars in the caravan would be very different of course, but the procession of police motorcycles, TV and camera bikes, director's car, then team cars stacked with spare bikes should be familiar. I presume the overhead chop-chop of helicopters would be surprising? What about the peloton? The colorful helmets, strange shiny material of the kit, and all the riders speaking English and wearing shorts and shoes not in black would be different, but perhaps our traveler would quickly recognize the roles and behaviors? The domestique, the leader, the jersey wearers, the pack fodder, the break and the grupetto, surely he would easily recognize them? What about the bikes? They would seem strangely fat and rounded, of a surprising variety of shapes, and it might take a while to figure out how the riders shift gears. And all those smooth forks and stays with the cables and brakes missing! But would the riders competing for the Tour win be competing for the stage win every day, or just marking time on each other in order to win overall, whether they ever won a stage? Old friends in the south go watch cars race in ovals and near-ovals. High schools still have cheerleaders in short skirts. On thing that jumps out to me watching a 70's or earlier peloton and the hoard today is that the riders in the group just do not or cannot keep a straight line, always weaving. This is at almost any time, need not be coming up to a sprint. Overall longer stems in use due to shorter top tubes. Just want to protect the wheel and position in the group more? While the total entries have climbed, and now reduced, (yet to be seen if this helps crash count) I just think that the peloton is just a bit overall more dangerous than it used to be. I think one of the biggest differences would have to be earbuds and all the info coming through them. Thankfully, at it's most basic, it is man and machine, a battle of will and strength over a great distance fraught with many and continual challenges. The fans will still be as enthusiastic, the magic of the Tour still ever present. Not as many riders use the drops, even when going full gas. One night, many years ago (let's say about ten or fifteen), my partner at work, a Pipe Fitter, was studying some Tour du France results. He could not help but comment that elapsed times seemed, pretty much, the same through the years. I gave little thought to is since commercial competition does little to interest me (I like amateur sports). As for things stay the same..? Human behavior, yes. Everything we touch, not so much. For me, this is the biggest change and we all know who to blame! Speaking of Americans who have had a detrimental effect on the Tour, I wonder what our time traveler would make of the absence of a winner for 1999-2006? Would he erroneously assume that we had been plunged into World War III? You might want to watch the retracing of the 1928 Tour route using '28 Fixed Gear Tour bikes. The movie is called, " Le Ride" is available in Goggle Play. I've followed the TdeF for over 30 years, in France and on TV (since 1986), when I was a schoolboy you could only get the tour on french radio stations - I'm not that old either ! However, much of the romance has gone with the mondialisation of the sport - since 1989 (the end of the Golden Age). When I first saw the tour in France (1974, and it came to England), you didn't recognise the names on the Jerseys (France-Soir, Kas, Molteni, Frisol...), of course you recognised Bic, Peugeot, Renault, there were Birtish riders, but relatively few. It is still a great event that I follow enthusiastically, visiting France for the tour every other year (not this year), and it is still the most photogenic sport. I think the old timer transported forward would say why are these guys wearing friggin merkin baseball caps at the end of a stage. And whats with the foam domes. There's a record ride in the uk, the LEJOG. Lands End to John O'Groats, nearly 900 miles. I was looking at the times, and the record time currently is only 10% faster than in the 50s. I think the time travellers would feel at home in a matter of minutes. If they were a geek, all the gear would be fascinating, but the event itself, easily recognisable. 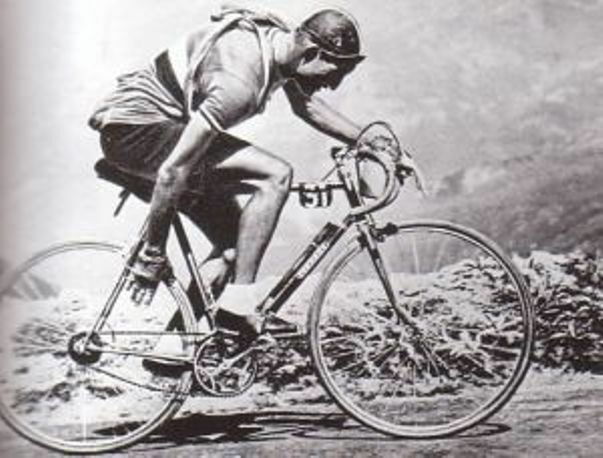 It would have been fun to watch Gino "My Italian Secret" Bartali and the others changing gears on Cambio Corsa and other early derailleur systems. This one looks like particular fun, with a suicide half-step shift in front, as well. Ever watch any of the American TV coverage of the Tour? Back in the mid 1980's, CBS used to send their own camera crews to France to cover the race. And they I'm sure annoyed the hell out of the riders by sticking cameras inches away from the rider's faces during difficult time trials (are there any other kind?) and when getting dropped on critical mountain stages. CBS spent a ton of money and got some great shots, ones none of the other camera crews were getting. Plus they paid professional musicians to do the background music, CBS really went all out back in those days, I have never seen Tour coverage that good anywhere. Dumbest think I ever read. Winning the Tour is paramount over stage wins. That's the way its always been. He would think its stupid that the winner was stripped of the wins. He would probably remark, "Jeez, you should have seen what we used to take". Then-probably some coke heads. Now-everyone has asthma, one might think that a hindrance in any other sport . Definitely don't agree with that. Only a half dozen riders have a shot at it, and teams can potentially support an up and coming talented rider to get hem a single stage win which puts their rep up a hell of a lot. Then you have the sprinters, who are only after stage wins, like Cav, although it looks like he's not up there this year. Each team will have their goal, and not many will realistically be aiming for the GC win. Thats not what my comment was in reference to. The original commenter stated it was Americans fault that the GC leaders don't try to win every stage. Which my answer was that has never been the case. If you look at this list of all tour champions there are plenty that have 0 stage wins or only 1-2. Merckx and Bartoli are outliers with 7-8. The average is probably 2-3 and even lower if you take away time trials. Last edited by brianmcg123; 07-14-18 at 03:35 PM. For me, comparing then and now is worth mentioning everything that happens off the bike (besides questionable pharmaceuticals). The sports science that goes into recovery between stages must have come a long way in 30 years. It is the day after day grind that most impresses me about these athletes and you have to know the methods used to support them between stages must be very well developed. Great discussion. 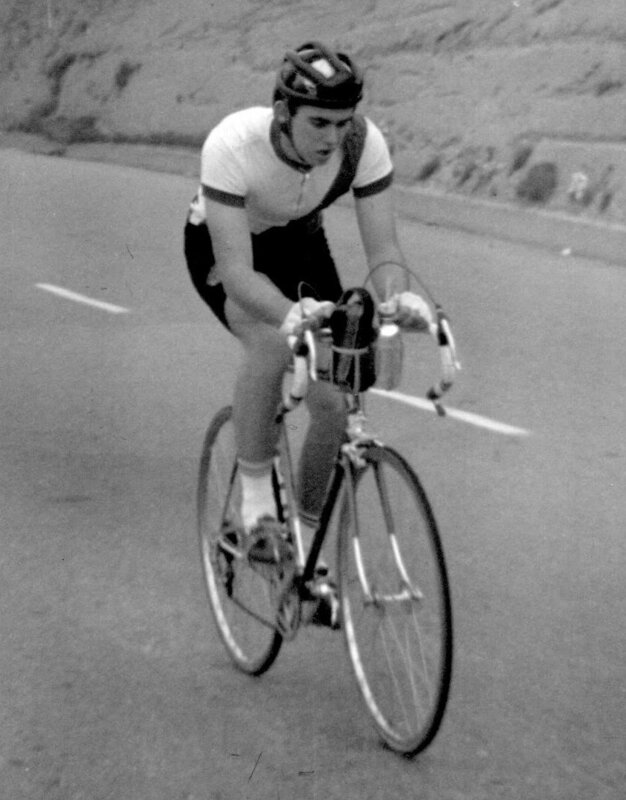 I never made it to Le Tour, but as a junior racer back in 1964, we sure had a lot of fun trying. Here's a couple of pictures, then and now. 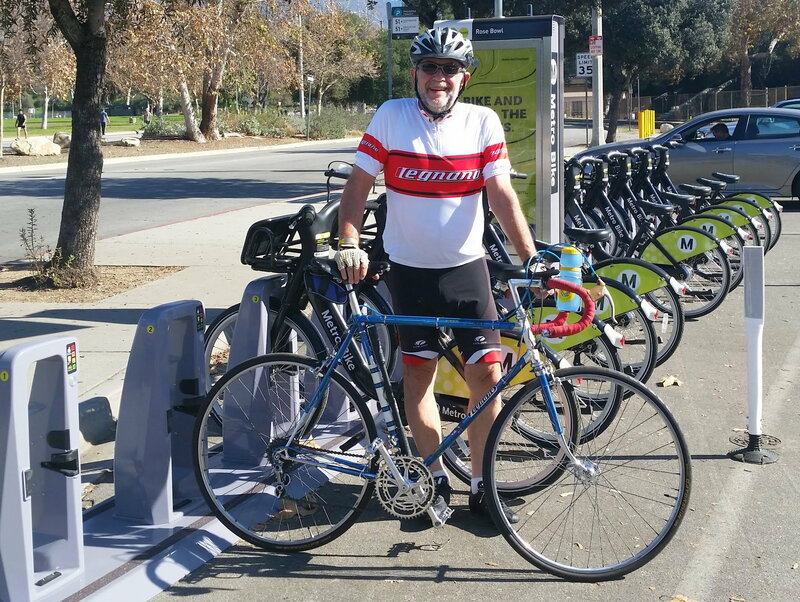 Same bike, same rider, easier gears now, and more colorful kit. I was a bit hasty and incomplete in my post. It was aimed more at the current philosophy of the focusing the entire season on winning the TdF. Prior to the mid-1980s, the great riders had several priorities during a season. They were much more complete riders than the specialists of the modern era. I apologize for the confusion. People around here can be pretty unforgiving of a poorly-worded post, even from a 5 star poster such as yourself. I'm a little shocked sometimes at the vitriol, but such is human nature. I read somewhere that sudden, unprovoked hostility toward others can actually be a symptom of depression. Interesting theory, if true. Last edited by Colnago Mixte; 07-15-18 at 08:04 AM. That is why I have more respect for Froome this year. I really do think he is going for the triple as the Austrian Worlds' course does suit him well. Now that Porte is out, his chances of winning the double have also improved pretty well. I also like Nibali because he was never a one race type either. So yes, LA was a specialist, but if Froome bombs out, and the Pyrenees could easily do it, it may be the only way to win the TdF.